Are you thinking about preserving your dog's paw prints? Doing so can serve as a lovely keepsake of your life together. Dogs have truly been mankind's best friends in the animal kingdom. What other creature has expressed such a desire to walk beside us and share our lives? Sure, you might say cats fulfill a similar role, but do they honestly express the kind of unselfish devotion you get from a canine? Perhaps a few cats display that kind of affection, but as a whole, cats are far more independent creatures. The bond between humans and dogs is intense, but it is all too brief. Since most dog lives average between ten and fifteen years, many of us will have multiple canine companions during our lifetime. Each relationship is special in its own right, but we never forget our furry friends who have passed on before. Many of us keep photos of our beloved pets, but those are only a one-dimensional keepsake. On the other hand, paw prints can become three-dimensional treasures allowing us to "touch" our pets long after they have departed. Your pet's paw prints can be easily preserved with one of the many kits available on the market. In a nutshell, all you need to do is make an impression of your dog's paw print in the material provided and let it dry overnight. Once the material has hardened, it's ready to mount in the space provided on the frame. Most kits provide a space for your dog's photo as well, and when both items are combined, you wind up with a very touching keepsake you can treasure for years to come. Capture paw impressions when your pet is a pup, and then purchase more material to add impressions of your dog's paw when he/she is fully grown. You can also preserve a parent and pup moment with prints from both. If you happen to be a scrapbooking fan, there is another great way to preserve your pet's paw prints and create a one-of-a-kind memento. You can actually acquire your dog's own prints using a non-toxic ink pad. 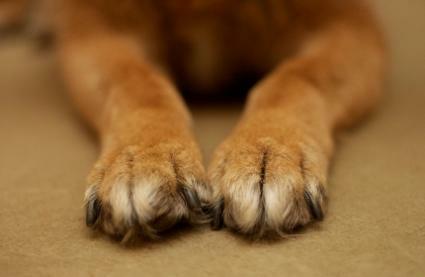 Craft or archival ink works great on paper, but it can't be easily wiped from your pet's paws. A water-based ink pad is a better choice. Then, as long as you use acid-free paper and cover the print with glass, the image should be well protected. Once you have a clear print, let your imagination run wild. You can combine the image with photos of your dog, a sample of his/her fur, and anything else that recalls special memories the two of you have shared. Whether you prefer to use an impression or a print, you'll need to prepare your dog's paw for the process. Wash the paw and be sure it is thoroughly dry before proceeding. Trim away any excess hair between the pads, and clip the nails so you will get a clear impression. Practice with your dog first by handling his/her foot and pressing it against paper without using any ink or other material. This will train your pet to relax during the process and will result in a much better image when you do it for real. It doesn't really matter how you choose to preserve memories of your dog. The important thing is to just do it. Once our beloved canines pass away, the opportunity is lost. Wouldn't you rather have something a bit more concrete to keep your pet's memory alive?